Audi, the premium car maker from the Volkswagen fold and the latest entrant in the luxury segment, has declared its intention: topple Mercedes Benz from its second spot in the next two years. Michael Perschke, head, Audi India says, "We are the fastest growing luxury automobile company in India. We have grown by over 80 per cent till November to sell 5,117 units. Next year too, we expect to grow faster than the market and sell around 8,000 - 8,500 vehicles. We are looking at becoming the second largest player in the market by 2013." Coming from a company, which has been around for only two-and-a half years, the claim may sound over optimistic. But it is based on sound numbers. While both Mercedes and BMW -- the number one player in the segment -- have found it hard to meet annual targets this year, Audi has revised its sales projections upwards twice for the year. The slowdown in car sales doesn't seem to have hurt its prospects. The company is now looking at closing the year with a sale of around 5,400 units -- 20 per cent higher than the initial target of 4,500 units for 2011. Mercedes, in the meantime, has grown by 31 per cent to sell 6,698 units. The numbers are considerably lower than the initial 10,000 units the company had targeted selling this year. BMW, which had also targeted 10,000 units for 2012, has sold 8,042 units between January and October this year. While Audi aims to roll out 6,500 units from its plant in Aurangabad on a two-shift basis in 2012, the remaining sales are expected to come in from imported vehicles. The company currently assembles sedans A4, A6 and luxury SUV Q5 in Aurangabad, while A7, A8, R8, RS5 and Q7 are brought in as completely built-up units (CBUs). 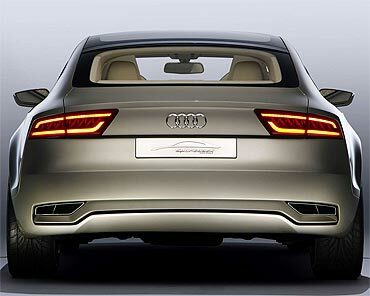 The key to Audi's India strategy is to beef up the product portfolio the company has on offer in India. While the company has firmed up plans to introduce one-two models annually to rev up volumes, other products would be brought in to consolidate brand appeal. Perschke explains, "The Indian market has the appetite for one or two volume building models every year. So this year while we introduced sedan A6 to bring in the numbers, we brought in A7 and A8 to strengthen our brand presence in the country. Next year, you will see the Q3 and S6, apart from an upgraded A4. 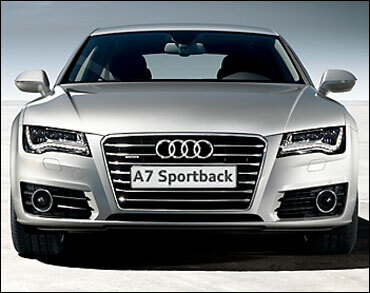 Audi has 28 models globally, of which nine are available here at present. We have enough to address the requirements of consumers in India." 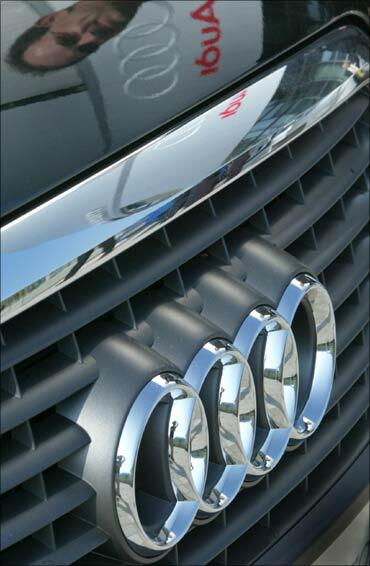 What has perhaps worked for Audi, inform industry observers is the company's responsiveness to the market in India. An industry source said on condition of anonymity, "While Mercedes does not have any product to pit against BMW X1, Audi quickly responded to the potential in the segment by deciding to bring Q3 to India. There is a demand for luxury cars priced between Rs 20 lakh and Rs 25 lakh, Mercedes does not have a product in the category." Mercedes does not have any product below the C Class, priced between Rs 26 lakh and Rs 33 lakh (ex-showroom, Delhi). BMW has filled the void by offering the X1 – a compact SUV – which is offered upwards of Rs 22.5 lakh (ex-showroom, Delhi). 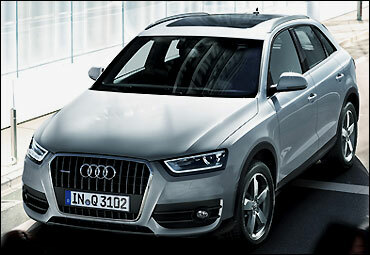 Audi has not disclosed the pricing details of Q3 but it is expected to be around Rs 24 lakh. Since its launch in December last year, BMW's X1 has been increasingly contributing to the firm's sales tally in India. Till November this year, BMW sold 2,344 units of X1, accounting for around 30 per cent of the overall sales for the company. The three SUVs that Benz has to offer in India is priced between Rs 50 - Rs 75 lakh -- a leviathan compared to the X1. Audi is hoping to address the X1 segment with SUV Q3. Around 21,000 luxury vehicles are expected to be sold in here in 2011, and this is slated to increase 10-fold to 2 lakh units over the next 10 years. India is unique in that it holds great promise for both ends of the market—the small car as well as the luxury sedans. Consequently, luxury car makers are gearing up to entice both these kinds of consumers to speed up sales. While the BMW I-Series is expected to hit Indian roads by 2012-end, Mercedes is mulling over bringing in A and B Class premium hatchbacks over the next two to three years. Perschke says, "Compact cars lower the entry barrier to a luxury brand and has impact on market elasticity. Sales stand to grow exponentially. We are not considering introducing A3 immediately as we want to grow our brand as well. We are looking for at least 28 per cent share in the Indian luxury car market by 2015. We have enough on our dashboard to get there." In March 2010, after being the number one for 15 years, Mercedes Benz lost the mantle to BMW. BMW edged out Mercedes again in the last financial year by posting sales of 7,079 cars verses Benz's 6,670. It had zoomed past its rival after just five years of entering the Indian market. If Perschke has to be believed, Audi should also take around five years to topple Mercedes.